As has been reported elsewhere, Attitude did not 'pretend to have been the only model for exhibition practice'. Nor was its intention to be 'the biggest and the best, the first or the most'. Instead it aimed to be lean and strategic in its approach to a recognised impasse in local exhibition practice. It was no accident that the project's origins sprang from the sources involved. The invitation for such a project came from the Sydney Super-8 Film Group, an organisation dealing with its own members' melancholia and nostalgia for heady days gone by. A time when overflowing audiences attended its annual festival and its self-reflective films and critical writing were at the cutting edge of local thought. For its own survival it had to evolve into an organisation that epitomised the changed nature and possibilities of its milieu. Thankfully it was not yet immobilised by its own institutional imperatives and therefore was still flexible enough to take the risk to 're-think and re-animate'. 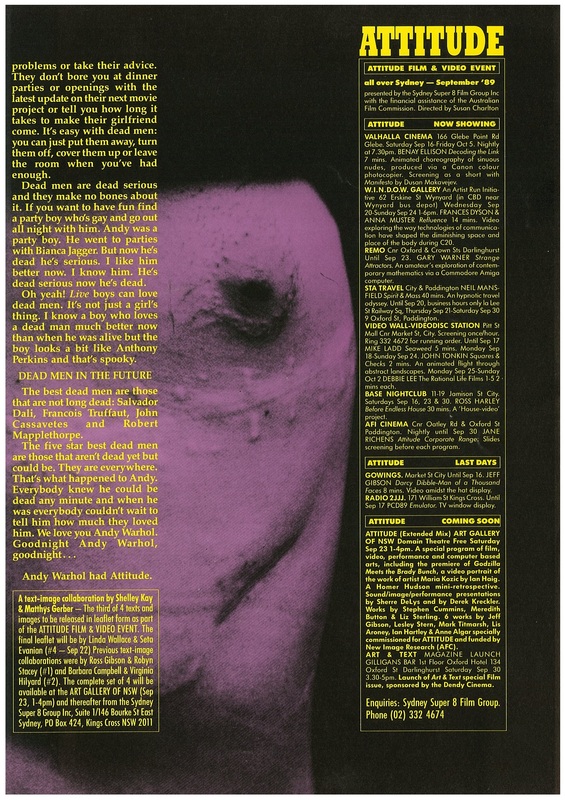 The conceptual and entrepreneurial drive of the project came from a curator/director with years of employment in all aspects of independent and experimental image-making, including distribution, publicity, programming, production, funding, management and writing. The curator imagined herself as an audience no longer capable of enduring thematic media events, where individually interesting works might be submerged in an approach to programming resembling that of a trade fair. She dreamt of something that she and others would be keen to see, rather than [be] obliged to see. Attitude was an idea that had been looking for the conditions to happen for quite some time. It was perhaps fortunate that, of necessity, complete funding for the project was sought from the Australian Film Commission. Because it's not at all clear that any other government funding source would have responded with the same vigour and elegance as shown, in particular, by Cathy Robinson, in her then position as Director of Cultural Activities. Few projects funded elsewhere can feel the same confidence that their officer is actually working with them, rather than against them at the negotiating table. 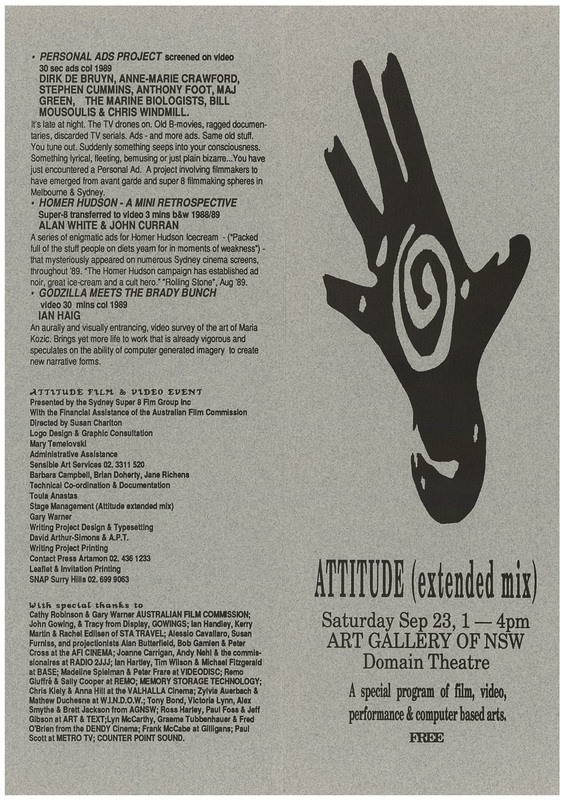 When at least 500 people surged into the 350 seat Art Gallery of NSW theatrette on Saturday September 24 1989 to see the extended-mix program of film, video, sound, performance and computer-based arts, it was clear that Attitude had 'worked'. That these people -- an amalgam of various 'arts' audiences felt compelled to attend, was just one of the effects Attitude hoped to realise. It had reached and extended its expected audience and invigorated a critical milieu. 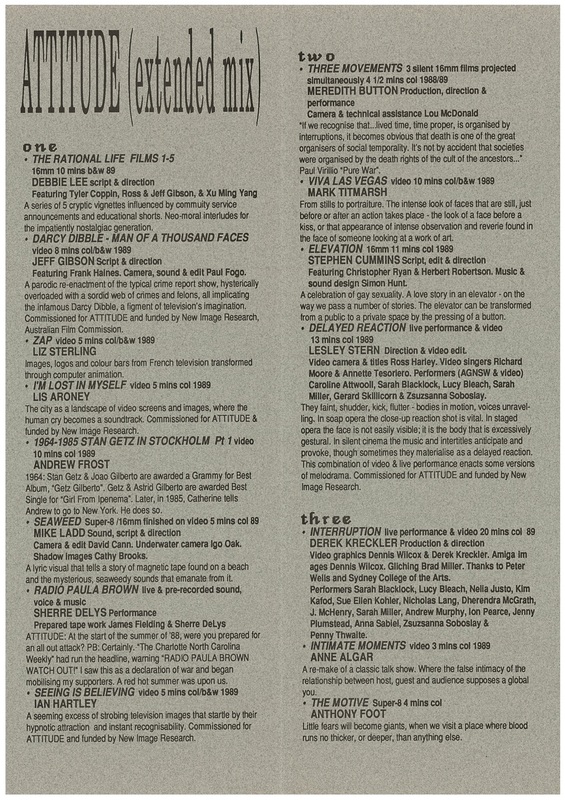 Submission notes had stated Attitude's position: 'We want to attract the attention of a variety of audiences -- each of which has equal standing in our eyes. They are: those who are interested in the program and wish to seek out many of its parts; those who are habitues of individual sites and come across Attitude works as a result of their normal practice; and those who are made conscious of sites and works by accident. We do not believe that it is necessary for an audience to see or know everything to have experienced the program. On the other hand, we do not want to work against that possibility should audiences desire it'. The 'typical' Attitude experience seemed to include the deliberate sighting of one installation, an accidental encounter with a second, the collection of two editions of the writing project, and attendance at the AGNSW show. 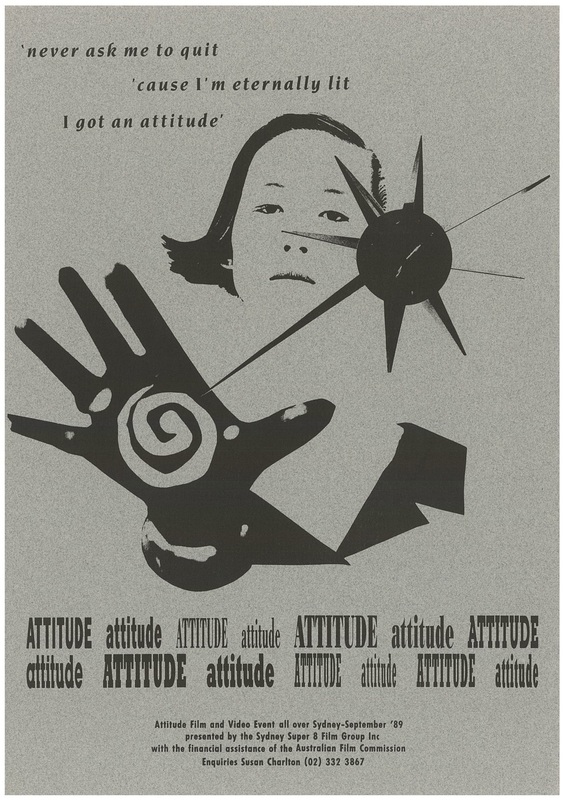 Attitude's momentum was propelled by the audience's affection for a project which did not demand all of their time; which entered their consciousness in sometimes surprising and unexpected ways; and had high production values and a 'gift-like' quality about it. The director heard reports of fans of the writing projects, who by the third week had begun to hang out for the next instalment. 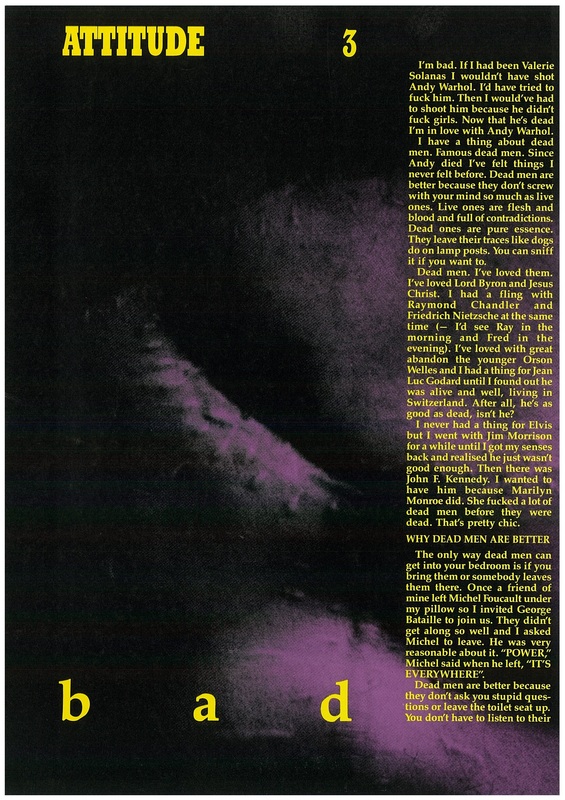 She was also approached by strangers who enthusiastically informed her that they hadn't liked everything in the extended-mix program, but that had only encouraged them to get to work on their own projects. There was a logic to the location and placement of each work: Jeff Gibson's Darcy Dibble - Man of a Thousand Faces in the window at Gowings' menswear; Gary Warner's Strange Attractors at Remo's design emporium; Debbie Lee's Rational Life Film #1 beaming from the video screen in the Pitt Street Mall [although Debbie never managed to see it screening there]. In some cases, it was possible to see a work in more than one site, eg Mike Ladd's Seaweed screened in Pitt Streeet and at the AGNSW. This was more than just a chance to 'catch up' with something missed elsewhere, but also an invitation to read works in different social, spatial and aesthetic contexts. Perhaps this appears all too rosy a picture of the event. Attitude did not pass without criticism, it's just that its various audiences remained quite'philosophical' about its perceived successes and failures. Though some projects received less marketing, audience and critical attention than others, each maintained a certain integrity. Critiques were offered, but within a context of general approval. Attitude's aim was to succeed -- the small gauge milieu probably could not have sustained another injury. Ultimately it was a modest project with manageable intentions. The most important area of displeasure involved some of the effects of 'going public'. When art moves beyond the boundaries of the gallery or the cinema it gains certain freedoms, but (as it became apparent) can lose other privileges. 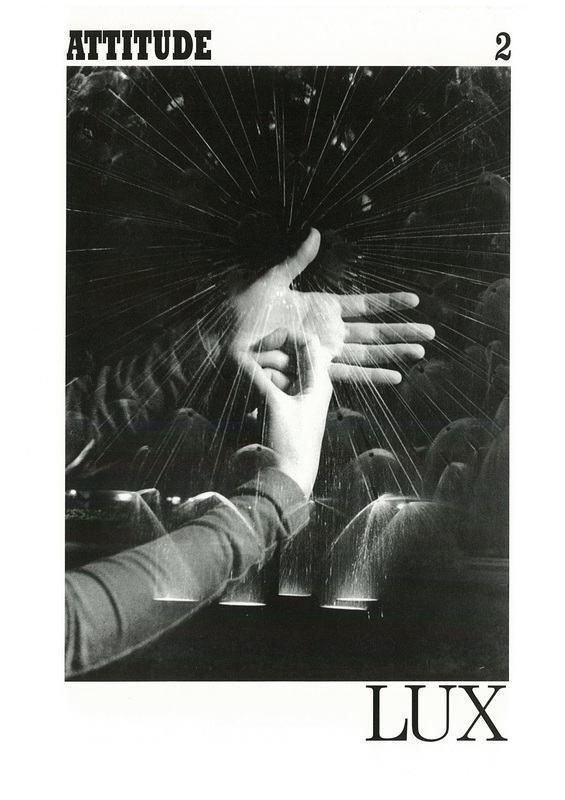 Some artists thrived on the opportunity to show their work in the shopping mall or the nightclub, only to experience varying levels of sound loss and image distortion, or to find that audiences were fleeting. Though their projects may even have been concerned with the very idea of image traces upon the city, the reality of this fragmented reception sometimes bordered on the unacceptable. That day at AGNSW was full-on with so many people that some of the amenities just could not cope. Juggling such a large audience meant a few of these works were unable to be shown. We just ran out of screening time and had to leave. Apologies again to those artists.